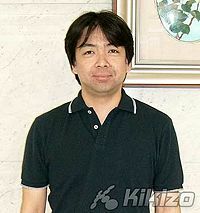 Ko Takeuchi (竹内 高 Takeuchi Kō, born 1970) is a Japanese video game designer working for Nintendo since 2000. He specializes in video games and music. Takeuchi is one of the key developers of the WarioWare series. Among his most important work in terms of Nintendo games is the character design of the WarioWare and Rhythm Heaven series. The first Nintendo games Ko Takeuchi was involved with are Tottoko Hamtaro: Tomodachi Daisaku Ikusa Dechu and Wario Land 4. In 2001, Takeuchi founded his own design studio Kokosac along with his wife, Sachiko Imai, a visual artist herself. Ko Takeuchi was born in 1970 in Kōchi in the Kōchi Prefecture of Japan. Early in his life, he became interested in video games, such as the Game & Watch handhelds and the Famicom console. Takeuchi graduated from the Horikoshi High School in Tokyo, later he traveled to the United States of America and studied at the Cartooning Faculty of the School of Visual Arts in New York City. After his return to Japan, he applied to different companies related to visual arts, including at least one game company, the now-defunct developer Warp. He joined said company and entered the video game industry this way. During his time at Warp, Takeuchi worked on Sega Dreamcast games, including D2, of which he was one of the designers. Afterwards, he joined Nintendo in 2000. The first Nintendo game he was involved with is Tottoko Hamtaro: Tomodachi Daisaku Ikusa Dechu, released in the same year. Takeuchi took the role of the assistant director. The next game he worked on is Wario Land 4, for which he was responsible for the background graphics. In the year of the game's release, 2001, Ko Takeuchi and his wife Sachiko Imai founded their own design studio, Kokosac, located in Kyoto, Japan. Takeuchi is responsible for the character design in all games of the WarioWare series, starting with WarioWare, Inc.: Mega Microgame$! released in 2003, and is a key designer of the franchise in general. He designed newly introduced characters such as Jimmy T., Mona, 9-Volt and Ashley who have become a recurring cast since. The title character Wario has also been given a new appearance by Takeuchi for the series, wearing a biker outfit. During the development of WarioWare, Inc.: Mega Microgame$!, Ko Takeuchi also sometimes worked with Hiroji Kiyotake, the original designer of Wario. He created the artwork for Ashley Meets Halloween and Barbara and Ashley online comic series. His characters, be it in video games or other media, are usually based on real people, including his friends, colleagues and people he met on the street. When Ko Takeuchi sees a fascinating person who might be the inspiration for a new character, he draws them in his small sketchbook. Takeuchi's style, which is commonly seen as "cute", is influenced by artists such as Akira Toriyama and Yoichi Kotabe. During his studies, Ko Takeuchi had to put aside his passion for playing video games because he was so busy. Today, he still plays video games as time permits. Takeuchi has specifically told about his enthusiasm for the Mother series. He referred to the game Mother as a masterpiece and stated that he played through Mother 2 (EarthBound) three times. 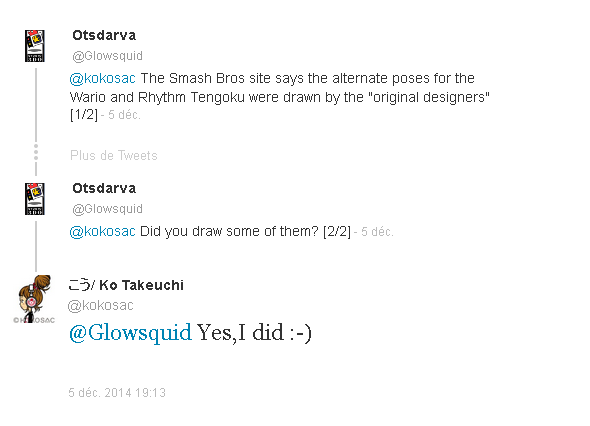 When Ko Takeuchi tested WarioWare: Snapped! during its development, he got mad by the slideshow at the end depicting himself and yelled "What the?! You darn thing!" and "No one said anything about this!" This page was last edited on December 12, 2018, at 11:16.